We are very excited to announce that Camp Pioneer will be offering an ATV adventure program again this summer, with a new and exciting expanded Phase II program. Open to participants who are age 13 by June 1 of the current year, the ATV Program offers an exciting new way to experience the great outdoors near Camp Pioneer. Each participant must also have a fully executed original Participation and Hold-Harmless Agreement signed by both parents or legal guardians if the participant is under age 18. Waivers signed by anyone other than the parents or legal guardians (including Scoutmasters) are also not sufficient. 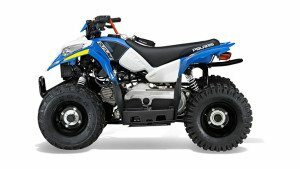 Any participant who does not present a fully completed original Participation and Hold-Harmless Agreement at Camp will not be allowed to participate in the ATV Program. You can download the Participation and Hold-Harmless Agreement by clicking here: ATV Program Hold Harmless Agreement. Using the ATV Safety Institute’s RiderCourse, the nation’s premier ATV safety curriculum, program participants will learn proper ATV safety principles, trail conservation, and the Tread Lightly program for minimizing ATV impacts on wilderness areas. Upon completion of the online portion of the course, the system will issue you a certificate of completion. All participants MUST bring this completion certificate with them to Camp in order to participate in the Camp Pioneer ATV Program. We do not have the ability to provide this portion of the training to Scouts or Leaders on Camp property. Any participant who does not have the certificate will not be able to participate in the Camp Pioneer ATV Program. Upon completion of Phase I of the Course at Camp, participants will receive a RiderCourse certification, which allows them to ride on public lands in some states. Check your local laws for details. Cost per participant is $50.00 for Phase I. To participate in Phase II, a Scout or leader must have completed Phase I of the ATV Program at Camp Pioneer, or have completed the ASI RiderCourse at some other time and present their certification card for review by the program staff. Phase II will include a refresher of the safety protocols taught in Phase I, and will then focus on applying those skills to a longer trail ride while completing an exciting geocaching adventure.